The HAM Radio Spirit Lives — in Robots? Ham Radio Spirit Lives in Robots? Competitive robotics — a new type of Elmering. I want to tell you about an area of technology that I am involved in that’s growing in popularity among high school kids today. Just as ham radio provided opportunities for the youth of earlier generations to learn about electronics, electricity and physics, today hobby robotics seems to catch the attention of kids. Four years ago the company I work for received a request from an instructor at the local high school for a volunteer to teach some kids computer programming and mentor them on an electronics project they were working on. Since that was the high school I graduated from and the request came from a mentor at that school who had introduced me to ham radio, I thought I would volunteer and “give back” to the school that had been such a big influence on my life. When I arrived I was enthusiastically greeted by a dozen kids who wanted to get down to business and start learning electronics and computer programming. When I asked them what the project was, they showed me a 120 pound remotely controlled robot designed to play a sophisticated game of tic-tac-toe against other robots on a playing field the size of a basketball court. They told me it was all part of the FIRST robotics program. FIRST stands for: For Inspiration and Recognition of Science and Technology. FIRST is a program with international scope joining students, professionals and corporations together to expose high school students to engineering. 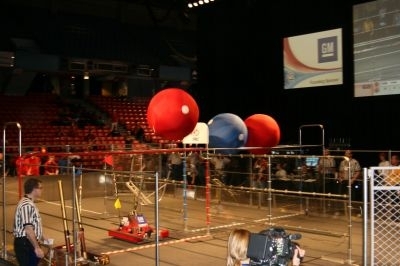 There are over 2500 robot teams staffed by thousands of students and mentors that compete annually all over the world. For most of the match the robot was remotely controlled by two operators via a 900 MHz wireless link. The robot can also send telemetry back to the operators. But for the first 15 seconds of the match the robot must play the game autonomously, under its own intelligence and sensors. That’s where a lot of programming and electronics come in. My job was to teach these kids the fine art of software engineering as it pertained to the robot. They learned how to identify the issues and come up with solutions. They had to learn C-programming and how to compile and download the programs into the robot controller. Then they learned about testing. I had to learn how to use all the programming tools that they were supplied before I could teach them. Due to time constraints we didn’t have a lot of sensors on the robot, just some limit switches to make sure the forklift mechanism didn’t over extend itself. Did I mention that the kids only have 6 weeks, from the beginning of January to the middle of February to design, build and test the robot? They get the rules for the game at a big nationwide event that is webcast and the robot must be crated and shipped to their first competition 6 weeks later. This is an after school activity so the kids were back at school every evening for 4 to 6 hours and all day on Saturday. That’s quite a commitment for kids and mentors. 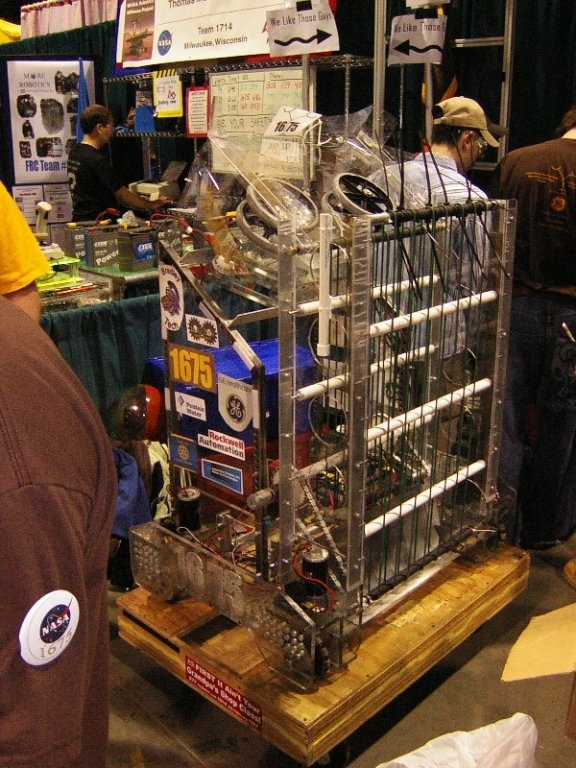 In March of 2005 our team 1675 and robot competed at the Midwest regional in Chicago with 30 other robots. Surprisingly we won the Rookie all-star award given to the rookie team with the most competitive rookie robot. This award qualified us to go to the National Championships to be held in Atlanta. We had almost 4 weeks between the Chicago Tournament and our trip to Atlanta but we did not have access to our robot while it was in transit. We needed to add autonomous operation to our robot to be competitive at the next level. My programming kids said they knew what the robot had to do and they could simply drive the robot through the tasks required. 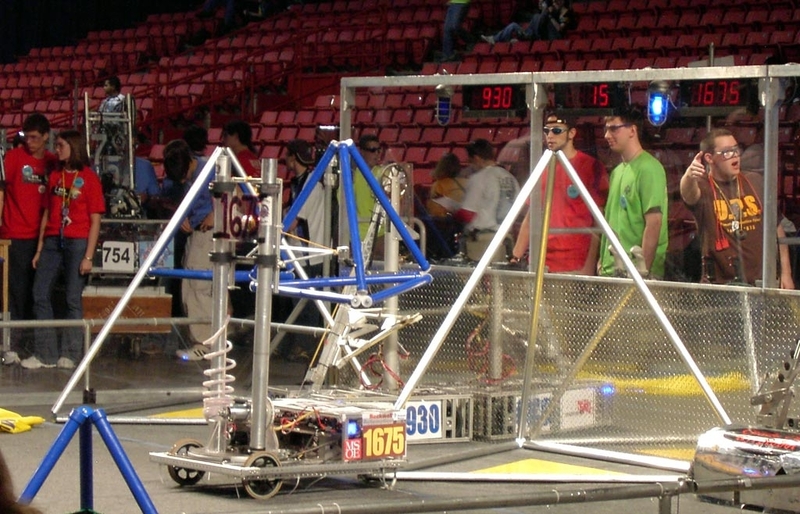 All we needed was a way to teach the robot how to do it in the 1 day of preparation we would have before the tournament. With the skills they learned during the year they wrote a program that would capture the commands from the RF linked controller and store them into memory. Then they could simply play back the commands from internal memory during the competition. During practice day in Atlanta the kids taught their robot how to execute the tasks and it repeated those same moves time after time, scoring many points during the autonomous operation. We finished in 26th place out of the 300 robots that were at the National Competition. 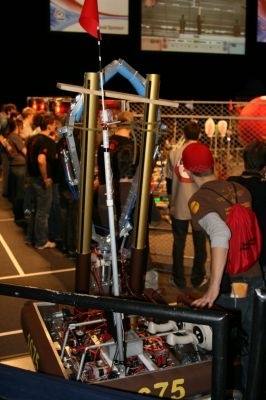 That was my first year in the robotics program. The scenario has repeated itself over the last 4 years but the games and challenges change. We’ve played three-on-three basketball, another version of tic-tac-toe using inflatable inner tubes and in the spring of 2009 a version of NASCAR racing while dribbling a 4 foot diameter ball. We have a lot of turnover in kids due to graduation every year. Most of the kids on the team I worked with in 2008 were new so I had to teach programming and electronics all over again. Fortunately one programmer kid returned and we could build on his experience and he could help me teach the basics. We’ve added a vision system that could recognize the targets on the playing field so our robot is aware of its surroundings. We used the same program for training the robot to play the game autonomously as we did in 2008. Over the short 4 year history of the team we’ve qualified to go to the international championships three times. To make things even more interesting in 2009, a new robot controller using a 2.4 GHz wireless Ethernet network replaced the old 900 MHz proprietary controller. I had my hands full trying to learn the system before teaching it to the kids who knew more about it than I did by season’s end. Aside from mentoring my original team I was recruited to help another rookie team — team 1714. I had the opportunity to teach them programming, electronics and some electrical and motor theory. This rookie team won rookie all-star awards at two regional tournaments and the rookie inspiration award at the international tournament in Atlanta last season. 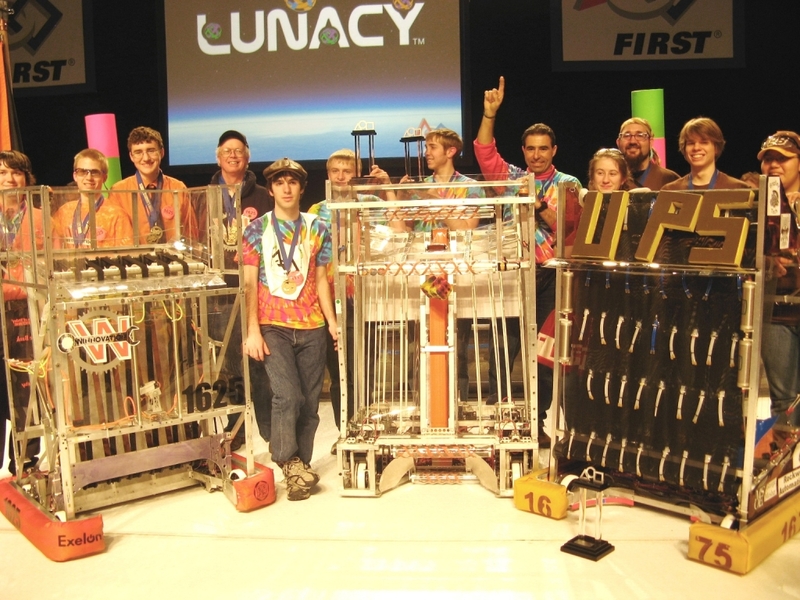 In the 2010 season they finished second in the Wisconsin competition, won the Minnesota competition but lost in the quarter finals in the championships in Atlanta. You have to be at the Atlanta competition to realize the enormity of the program. There were 300 robots and of 25,000 kids there to support and operate them. 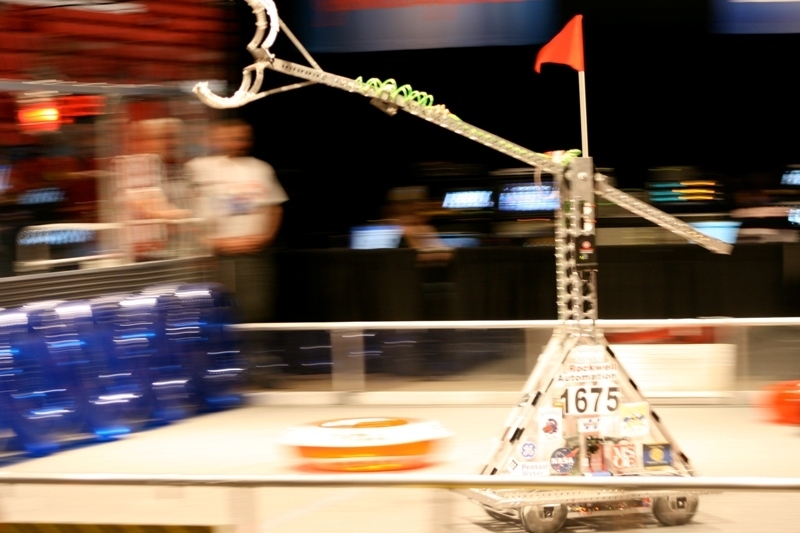 The competition involves more than just robots. Some kids were judged on the Web pages they designed for their team; others took part in the computer animation competition. There are so many opportunities for these kids to shine it’s amazing. Corporations are big supporters of the robotics program. Millions of dollars are donated to pay for venues, sponsor teams and provide scholarships to those who take part. There are also millions of dollars for scholarships offered to colleges all over the country. The program is growing in leaps and bounds. In Milwaukee alone there is an initiative by local business to support any Milwaukee public school that wants to start a team. There is a premiere regional competition at the Milwaukee Arena featuring over 50 teams each spring. Plans are in the works for a fall competition featuring smaller scale robots called VEX, after VEX Robotics, the company that is a prime supporter of the event and supplier of robot components. For a long time I was frustrated by the lack of interest by our youth in technology and ham radio. It seemed they were more interested in video games, TV and the Internet. Then I ran into these robot kids and found the inquisitive spirit that made ham radio so popular among us old timers was still alive, just in a different form. I wasn’t alone. Many of the mentors I met helping the kids with their robot projects had call signs. That’s right — ham radio Elmers are now robotics Elmers. I can see more ham radio operators being tapped as a technical resource for these robotics teams. Many of them will be rookies themselves and will have a lot to learn as they teach. Over the past 4 years I’ve learned a lot about the FIRST robotics program and feel that I can bring potential mentors up to speed so they can be a resource for these kids and their robotics program. It’s only a matter of time before these adult leaders start looking for advice. So I am hoping to convince our Technical Specialist Coordinator to create a FIRST robotics Technical Specialist (TS) position. The technical specialist would be available to go to organizations to talk about the FIRST and VEX robotics programs as well as the FIRST Lego League robotics program geared toward grade school aged kids. The TS would recruit mentors from the ranks of ham radio operators. At the same time I can talk up the parallels between this technical hobby and ham radio. All photos by Brian Cieslak, K9WIS. Brian Cieslak, K9WIS, an ARRL member, was first licensed when he was at Milwaukee’s Boys’ Technical and Trade High School in 1971. Back then ham radio and color TV were the cutting edge of technology. Thirty years later, with a bachelor’s degree in Physics and a career in embedded systems design, he is an Elmer for three robotics teams, one from his old alma mater, where his interest in radio began. He would like to thank Mr Stephens,WB9EFV, his Elmer, for introducing him to the ham radio club at Tech. Brian can be reached at 29119 Manor Dr, Waterford, WI 53185-1182. News & Features >> Features and Columns >> Features Archive >> Ham Radio Spirit Lives in Robots?